KC Place is located in Bangkok’s Pathumwan area, just 100 metres from Ratchprarop Airport Rail Link Station. A 10-minute walk from Phayathai BTS Skytrain Station, it offers a restaurant and massages. The air-conditioned rooms at KC Place are equipped with a fridge, cable TV and writing desk. Free bottled water is provided daily. The hotel features room service, laundry services and an on-site restaurant. More dining options are available at the nearby Platinum Fashion Mall and Pratunam Centre. KC Place is approximately 23 km from Suvarnabhumi Airport. Please note that a refundable security deposit of THB 1000 is required upon check in. A security deposit of THB 1000 is required upon arrival for incidentals. This deposit is fully refundable upon check-out and subject to a damage inspection of the accommodation. Air-conditioned twin-sharing room features a cable TV, electric kettle and refrigerator. It also comes with a hairdryer and free 2 bottles of drinking water. 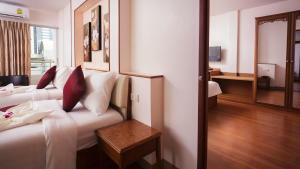 Rate: THB 1155.00 ... THB 3600.00; select dates below to get current rates. Located on higher floors, room features a personal safe, flat-screen cable TV and electric kettle. It also has a refrigerator, hairdryer and free 2 bottles of water. Guests enjoy free Wi-Fi. Large room for 4 persons. Includes air conditioning and a seating area. It comes with a cable TV, refrigerator and electric kettle. It also has free 2 bottles of water and 2 free 24-hour Wi-Fi cards. Please note that some rooms come with a balcony which are subject to availability. Air-conditioned twin-sharing room features a cable, electric kettle and refrigerator. It also has a balcony and hairdryer. Guests enjoy free 2 bottles of water. 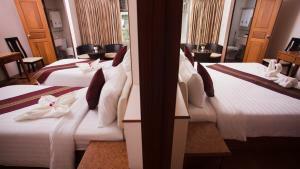 Rate: THB 1248.00 ... THB 3600.00; select dates below to get current rates. Larger than Deluxe Double or Twin Room. Room features a personal safe and views of the city from a private balcony.